In honor of the first official day of fall, I am sharing my top 10 favorite things about this season. There really could be a list about a mile long, because I love it so much. But, here is the best of the best! I didn't put them in a particular order, because that took too much thought and I kept second guessing myself. So, instead, I completely randomized it, to make me feel better about not selecting a favorite. 1. Crockpot meals. 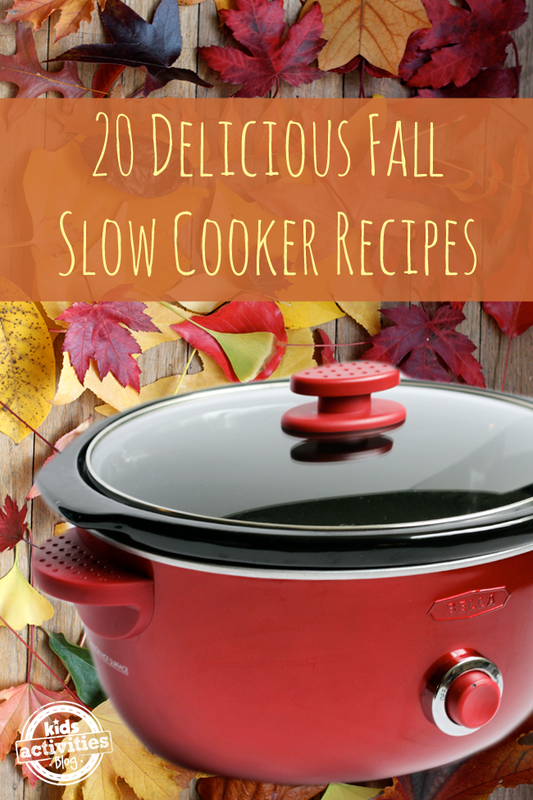 I really can't wait to do the majority of our cooking from the crockpot. It's my most preferred cooking method, but somehow doesn't seem great when it's hot outside. Here are a few of the recipes I'm going to try out in the coming weeks. 2. Crisp air. As much as I absolutely cannot complain about the beautiful summer we are having. Yes, it was over 80 degrees today, still. I am loving that the evenings are cooling off and there is a crispness in the air. It's so refreshing to feel a cool breeze blowing through the house and I looooove having the windows open during the day! 3. Football. Need I say more? Besides my hubby being a high school football coach, we are also UW Husky football fans, not to mention the WORLD CHAMPION Seattle Seahawks. Whoop whoop! Nothing screams fall like a Friday night football game, followed by waking up to College GameDay on a Saturday morning. I know it's not for everyone, but we love to sit around in our sweats, drinking coffee, hanging out with the kids and watching football games. In fact, yesterday, the hubby and I had a date day, hired two high school babysitters (a sign that you have a LOT of kids!) and headed up to Seattle for the husky football game. So much fun! Our 9-year old will be taking my place the rest of the season, but I got one game in before then! 4. Pumpkin anything. My obsession with pumpkin flavored anything is very real. My sister just bought pumpkin flavored pretzels at Costco and I nearly died. Heaven. I also love pumpkin cookies, candy, muffins, candles, etc. If it's made of pumpkins, give it to me!! 5. Pumpkin patches. Speaking of pumpkins, the pumpkin patch is one of my favorite traditions. We have so many of them around here and I love taking the kids! We have a yearly tradition of meeting friends for a large group picture. There are now 14 of them. 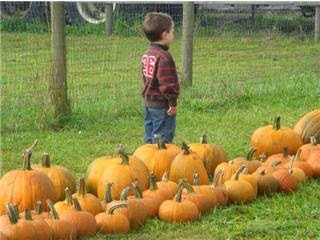 We also take just our kids up to one called Maris Farms, that is my favorite pumpkin patch of all. Sometimes, I'll even hit up a small one for a quick after school trip. Best part is that most of them are free!! One of my favorite pics from when Jake was just 2! 6. My birthday. Those of you who know me well, know just how much I LOVE birthdays. My birthday included. I try so hard to make birthdays special for my kids, just like my parents did for me. And some of my friends can appreciate my deep love for birthdays and try to make the day extra special, too. That's when you know you've got good friends! This year, my birthday falls on a Sunday, so I'm looking forward to a day of family time. my favorite. 7. Changing leaves. The Pacific Northwest is such a beautiful place to live, but in the fall, it's absolutely breathtaking. Mt Rainier, combined with clear sunny skies and orange/red leaves. Doesn't get much better. We love to take walks, crunching on leaves, collecting them and taking pictures with them. One of the coolest parts of nature. 8. Fall scented candles. I am totally a scent girl. When I walk into a house, I loooooove the cozy smell of fall candles. Pumpkin spice, candy apple, pear cider, etc. The warm, food scents are my favorite and instantly put me in a good mood. I've already started using my fall Scentsy waxes and am loving the smell of my house. 9. Sweat pants. After a long summer, we finally reunite! I love a good baggy pair of sweats and a tattered hooded sweatshirt when I'm lounging around my house. Our house is too warm in the summer for me to be able to do this, so the minute it cools down enough, I bust them back out. I mean, these sweats are so old that they've been cut at the ankles, have paint splatter and look downright nasty, but like a favorite blanket, I can't get rid of them. If it weren't for my 4 kids needing my undivided attention alllll day, I would be content to lay on the couch in my sweats with a giant cozy blanket, drinking coffee and reading a book, or watching some football. Does that just not scream fall?! 10. Starbucks' pumpkin spice lattes. I guess this could have gone into the pumpkin category, but because I love them so much, I thought they deserved their own. I've actually expanded my palate and really love a Pumpkin Spice Americano, as well. I know that the pumpkin flavor isn't real. But, I guess it doesn't bother me that bad. It's a treat I only enjoy in the fall and because it makes me so happy, it's worth it. Gets me every time. And there you have it. Fall....I just love you. And today I started decorating! Pics coming soon. What are your favorite things about this amazing time of year?! Pretty sure you just described my sweatpants... EXACTLY! And I agree, they're the best thing ever! You'll probably get to pull yours out before I do. Yay for fall... almost!